US Citizenship Podcast: USCIS Form N-400 is now online! Answer optional questions in the Naturalization Eligibility Tool to help determine their eligibility for naturalization. Create, edit, save, or delete a draft application. Pay any fees and submit the application. 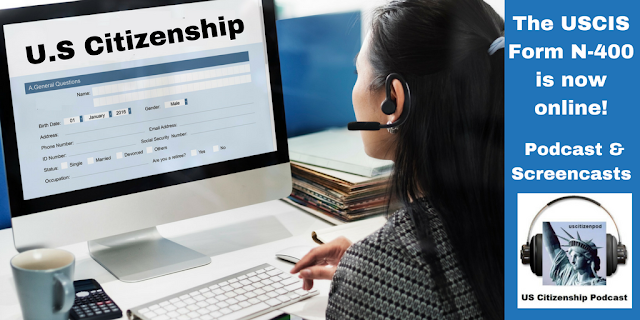 View real-time case information and the history of their interactions with USCIS. Securely and directly communicate with USCIS about their case. They are applying for citizenship based on having served in the U.S armed forces or based on their current service. They are requesting a fee waiver or reduced fee. We encourage you to file online for Naturalization. Thanks to USCIS for helping us become new US citizens in the New Year!